If you have authenticated pages such as email or premium accounts, you may get more relevant ads, thus increasing click-throughs and revenue. Before that, as of early November, AdSense team was testing out this capability. A selected group of publishers had been chosen to try out the new Site Authentication feature. The beta testing had taken 6 months. 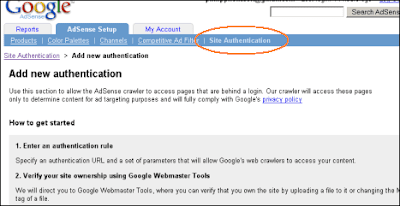 Specify an authentication URL and a set of parameters that will allow Google's web crawlers to access your content. Will direct you to Google Webmaster Tools, where you can verify that you own the site by uploading a file to it or changing the META tag of a file.